How would you like to have more money in your paycheck? Today I share how properly calculating your withholding can help you win with your finances. I spoke to Bob Meighan, TurboTax’s Vice President and CPA, the other week about ways to lower your tax bill and more. He mentioned a huge blindspot couples have when it comes to their money. Many couples aren’t handling their withholding correctly. Big Refund Later or More Money Now? Bob pointed out how people have a choice when it comes to withholding on their wages. Either you can be conservative, have more withheld, and get a bigger tax refund or you can adjust your withholding and see bigger paychecks throughout the year. For those who want to have an increase in their take home pay I want to share some tips on how you can calculate your proper withholding. I also want to introduce you to a very helpful (and free!) tool at TurboTax. I’m not sure how it went with you, but whenever I started a new job at the office I would get a packet of paperwork from Human Resources to fill out and read. 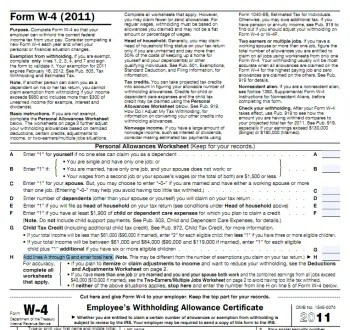 Everytime you start off at new job you should at least receive a W-4. The form assists employers to collect the proper amount of federal income taxes from your wages. That’s because there’s a good chance your tax obligation has changed and you want to adjust accordingly. The ‘fun’ part is calculating the amount. To get started, you need to grab last year’s tax return (assuming you’re making about the same amount of money) and your current paycheck. Add lines A through G and enter total here. As you can see, there are several ways you can answer some questions, so my suggestion is using a withholding calculator to help you out and look at different options. If you’re looking for an easy solution, please check out TurboTax’s site and use W-4 Salary Calculator. It will walk you through everything and guide you through the calculations. Once you have an idea on how much you need to have withheld for your paychecks you should contact your Human Resources Department and request a new W-4. Simply fill it out and return it to them. Are you struggling with student loans? Refinancing them could save you thousands of dollars! SoFi can be a wonderful option for you. They offer competitive and low rates (as low as 2.36%!) plus they’re offering a $100 bonus now! SoFi has simplified the process so you have less hassle. Learn more here and see if you can lower your payments today! We always count on refunds to bulk up long term savings goals like big ticket home repair (e.g. new roof) or for an eventual car replacement. As such, I’m fine with getting a refund, especially since interest rates are so low. I figure my strategy probably costs me $20 in interest a year, but I can guarantee that if I got that money every week, I’d end up with more than a $20 drain at some point, even if I fully committed to doing the same funding I do with the one-time windfalls that the refund brings. What I did this year was to max out my 401K for the first half of the year (because I was too lazy to adjust my deductions – oops!). Then the 2nd half of the year I zeroed out my W-4s, that way I don’t underwithhold. I personally like tax refunds – free loan to the government and all that, but it’s an easy, enforced saving for me. When I get that refund, I put the whole thing into a savings account. But as single person earning a decent wage, with no mortgage interest to deduct and very little business expenses, I OWE the government money 50% of the time. Even if I max out my 401K so I really lower my adjusted gross income however I can (short of making less). Since my income is vastly different at different times in the year, I just fill out my withholding to the best of my ability and stop worrying about it. I always end up with a refund, but at this point my finances aren’t efficient enough that I would be able to earn more on my own. Once I am working full time with consistent pay I will probably try to reduce my refund, but I wouldn’t want to end up paying at the end of the year. I understand the allure of the big check at the end of the year, but it is just as easy to take the amount you are overpaying and direct deposit the amount into a savings account. You’d still get the big paycheck and you’d be earning interest for yourself. I do not overpay my taxes and I haven’t missed not having a refund. I am a single mother of 3. I make a reasonable amount of money every week. I have one 3 children and because I make to much money I don’t qualify for subsidy housing. so I have to pay market rent. My rent is 1450.00 a month not including utilities i.e. gas and electricity. so I was wondering what I can do to get more money in my check every week instead of the government taking out so much taxes? I know I can change my deductions,but I was wondering for how long I can do it? Next Post: Let’s Start Travel Hacking Together!